Winners and “American Woman” mini-review! Thank you so much for all of your amazing comments…I have just come back from my weekend away and am in the middle of responding to each of you. It meant so much to me to read all of your kind words. I have been feeling less than confident about my sewing this week because I have attempted the Double Wedding Ring block, and it is slow moving…I’ve spent almost a week on a single block. Yikes! Y’all are raising my sewing self-esteem. Anyway, the winners were Molly (blogless–garment items) and Yahaira (quilting items). I am delighted to send each of them their packages! Thanks to all who entered, and hopefully I will have another giveaway soon. I did go to the exhibit at the Met, as promised. I admit that I am not as passionate about the fashions of the 1900s-1930s as, well, any other era, but I really couldn’t wait to see the American Woman exhibit. I feel guilty saying this, but I was a bit disappointed. The trip was worth it because the Met reopened its American wing and created visual storage. I went to see the American Woman exhibit on the tail end of my visit because I got sucked in by the period rooms in the American wing. I thought I may not have enough time (an hour), but I was wrong. I think the experience would be very different if you did not sew and were able to appreciate it overall, instead of fixating on the minor details. The collection was good, but not great. Each room featured about eight to ten mannequins wearing different outfits of the era, as well as sparkly and sequiny wigs that did not correspond to most of the exhibits or the outfits overall. The wigs themselves were interesting, but they were confusing in conjunction with the styles (particularly the House of Worth gowns). The exhibit was organized thematically as well as chronologically, which left out some important pieces from each designer. The manner in which the models were placed made it difficult for them to display larger pieces as well. They were each on a raised platform, which you could stand relatively close to. The House of Worth had only four or five dresses in the 1890s section, and they were all “typical” House of Worth: sequins, lace, etc. They were all very monochromatic in the 1890s section, and a couple of the more detailed dresses were black. The lighting was low, and it was difficult to make out the details (again, I think that is a sewer’s issue!). The second part was the Gibson Girl, and I wish I could tell you about it, but I was being knocked over by crowds of rowdy teens, so I strode on through. The women’s suffrage movement was next, and they had videos about the movement playing in the background. The clothes weren’t beautiful, but they revealed a lot about social concerns and attitudes about femininity at the time. The videos were projected all around the room…I’m still not sure how I felt about them. They were powerful, but distracting. The flapper movement followed, and I enjoyed that very much. I think you would appreciate it less if you did not sew and did not understand how much handwork went into these dresses, but they were absolutely gorgeous, if not very fragile. The dresses were in remarkably good condition considering their fragility and delicate beadwork. The exhibit did a good job of highlighting both the enormous range of details and the similarity of the silhouettes. The glittery wigs also worked nicely with these mannequins. The room was simpler to navigate and digest than the others. Finally, they did something about movie stars, and I honestly forget the name of the section. Sorry! This section displayed what many people would consider the highlights of the exhibit: the drapey dresses of Madeleine Vionnet and her 20s-30s contemporaries, which you would see worn by starlets in early movies. Like some of the other rooms, this one played movies on the walls. They showed the dresses in their original form, which I liked…context is always good. But my biggest issue with the entire exhibit was in this room, because they showed one of Vionnet’s dresses on a seated model. Vionnet is known for her draping…her work certainly does not belong on a seated model. It bothered me more than it should have, though. Most important, though, the exhibit did NOT make me want to run home and sew a new dress, which was not a good sign. I am so sad to be negative about it! I don’t want to say it was wholly not worth going because I am happy that the museum is exploring material culture and the history of dress. I am actually happy that there were a million angsty teens there, because I hope it will encourage them to learn more about the context of fashion and perhaps develop an interest in garment-sewing or textiles as well (even though they kept knocking me over like I was a frail, 90-year-old lady with a cane, rather than a relatively fit person in her 20s). To this end, the museum did a fantastic job of providing a great deal of historical and social context for each era…and everyone was reading and discussing the explanations. I do commend them on that. Final verdict: If you are already in NYC, go to it, but go to the new American wing first. June 26th is my six-month sew-iversary, and I want to share this momentous event with you by having a small giveaway. But first, I would like to take this opportunity to reflect on the first half of 2010. I can’t believe I have only been sewing for six months. Truth told, I did own a sewing machine (a 1940s-era Singer) back in ’08, and then it broke after about three months (and I still need to have that fixed). I made a dress with my mom once, long ago, and then I incorrectly took in an area of a nightgown that had a gap in the bust sometime last year. I sewed it wrong sides together, and pinched it outward, instead of in…and I STILL wear it that way, partly out of laziness and partly as a reminder of everything I’ve learned. Those were really the only two things I had ever done before Christmas 2009. I followed sewing and quilting blogs for a while, but I mostly knitted and crocheted; I always saw sewing as my mom’s “thing,” and I never thought I could be as good as she is, so I just never picked it up. And I think I took it for granted when I was growing up, too. She had tried to teach me to sew at some point by drawing shapes on paper plates and making me sew along the lines–my earliest exposure to paper-piecing! 🙂 I had also looked at a lot of quilting and textile traditions, taking a more studied and less practical approach to them through 08 and 09. From there, quilting kind of took over my life, and then garment sewing did, too. 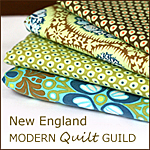 A month or so later, I posted on Alissa’s blog that I would definitely join a modern quilt guild in the New England area if one existed, and she e-mailed me and two others and asked us to create one. The other two people had a lot going on in their lives at the time, and even though I knew basically nothing about quilting, I did know a thing or two about creating groups, so I just plowed forward. Starting and then running NEMQG has been an absolutely incredible experience, and I can’t say how proud I am to be a part of an organization full of such beautiful, kind, and inspiring people. Including all of the trashed FOs y’all have never seen, it’s an average of five FOs a month (and I always complain about not having time to sew!). It’s very clear to me that I slowly developed an aesthetic that is true to who I am over the last six months. My preferences in both quilting and garment sewing lean heavily toward vintage and traditional, but with more modern/ brighter color schemes. After trying out a few of the quilting trends (wonky, red/ gray, etc. ), I can safely say that I am more drawn to traditional patterns and vintage/ thrifted or vintage-look fabrics. Obviously, the same goes for garments, as I sew almost exclusively from vintage and vintage-inspired patterns, despite their difficulty (and oh, how difficult they have been at times!). My craft bookshelf consists mostly of books that describe old quilting traditions and established quilting communities, as well as late 40s to early 60s fashion. Looking back makes me very emotional. So much has changed for me since I started sewing and the guild. I feel like I have established a true connection with a community, and created a stronger bond with my family as well. I want to thank each and every one of you for reading my blog, for your support and inspiration, and for being a part of my life. It has vivid color, good drape, and is very wearable. All you have to do is leave a comment telling me what your favorite hobby is! I don’t care if it’s quilting, sewing, or tatting lace. Actually, I’d love to see someone say that tatting lace is their favorite hobby. I’ll draw a winner on Tuesday, June 29 when I return from seeing the new exhibit at the Costume Institute in NYC (and stopping at Purl). Thanks for entering…and for reading all the way to the end! If you’re here, I commend you on your stamina. Butterick 5285, how I adore thee! You combine the best of both pleated skirt worlds: knife and box. Your instructions are clear and you fit with little tweaking. The major caveat here, of course, is that making a true knife pleat requires far more than “matching large dot to small dot.” If you’ve never made a pleated skirt before, you are in for a treat/ a lot of work. Crafting a true knife pleat that sits like a pleat in perpetuity requires no skill, but a great deal of patience. Butterick does an extremely poor job of explaining this, and their photo does not look like your FO would look if you only used their instructions. A sharp pleat requires constant ironing into submission, hand-basting of every pleat, topstitching and edgestitching on the front and back of every pleat…the whole shebang (if y’all want a tutorial on this, I will make one). The fabric is a heavy suiting fabric with a barely discernible texture (other people can’t see it, but I can and I love it); the zipper and hem, as always, are hand-sewn. And here’s the rub: if you REALLY want your pleats to sit right, you should hem both pieces separately either AS SOON AS THEY ARE CUT (double gasp). Learn from my mistake, please! I had to rip out all of my hand-basted pleats, hem the skirt, and then re-do the hand basting…thank God for Angela Lansbury and MSW. *A very short book review: this book is excellent as a review of the establishment and business of the Dior house (including the historical context in which it was created), but if you want pictures of Dior’s many gorgeous creations, you should look elsewhere. There are, at most, ten photos of his dresses in here. That’s right: another failed clothing project. This just isn’t my month! This time, it was Vogue 6999, a boxy jacket. And by “boxy,” I mean “boatlike.” I cut out all 16 pieces of the main fabric (a very expensive wool boucle); cut my interfacing, underlining, and lining (an even more expensive silk charmeuse), and went to work. I tried on the shell. I looked like I had the torso of Frankenstein, but I plowed forward. “I just can’t waste this fabric,” I thought, as I set about removing a full 3″ of shoulder cap ease. At one point, I had to admit to myself that it wasn’t just an issue of fit. The jacket really looked awful on me, so I cut 1.5″ from the front panel of each side. Do you ever go through periods like this? And if you do, at what point do you look at a garment that’s destined to fail and just call it quits? Oh, Vogue 5295, I had such high hopes for you. You were a spur-of-the-moment purchase, the kind I hardly ever make, because I thought you were adorable, wearable, and insanely versatile. I loved your fabric buttons and even your lovely shade of pink, which I thought would look nice with my coloring, since the model kind of “resembles” me. You didn’t even require a zipper (not that I mind putting them in). You were a nice, relaxing vacation project…at first. Soon, you became a mockery…the functional equivalent of Barbie’s chef’s apron. You asked me to follow your instructions for bound buttonholes. They were terrible. Why didn’t I use a tried-and-true method (not that I’m very good at any of them to begin with)? Why did my final product turn out looking like a brightly-colored pilgrim costume instead of a pretty, wear-to-work-and-then-out-for-drinks frock? But I will not hang my head sadly! I do enjoy posting about my failures as much as my successes, in the hopes that others will find comfort in my (frequent) sewing mishaps. I don’t know if it was me or the pattern this time (probably 90/10, with me bearing the brunt of the blame), but these things do happen. I hope your sewing is more fruitful than mine! P.S. My friend Amanda over at modernAcorn is working on a plan (involving quilts, of course) to aid an animal rescue organization that assists animals affected by the recent, devastating gulf oil spill. Hop on over to her blog to learn more about it! Not the most wearable garment, since I imagine it weighs quite a bit, but the draping is gorgeous. It’s silk and it isn’t a knit, if that excites you (it excited me). The black dress elicits an emotional response from me. The details are so beautiful and executed perfectly–look at the fluidity from the bust downward. Gorgeous. For those of you who notice such things, when the Met uses a true dress form (not a mannequin for presentation purposes), they use Wolf. It really is the fairest of them all <sigh>. Beautiful pleating and draping again, no? I think the overall effect would be significantly enhanced if the dress fit the mannequin better…the gap in the bust and armscye distracts me (am I crazy?). I hope anyone within the vicinity of NYC will see fit (pun intended) to visit this exhibit…maybe you’ll run into me there! I’ll be the one weeping in front of the cycling costume. Note: does any other WordPress blogger know why my photos suddenly have blue frames? into these lovely, smooth-looking sleeves in no time! There are many ways to accomplish this; Esther’s “walking” method is a great one. I just cut it out and sew as directed, letting the fabric pleat up in the original sleeve as I sew. Then, I measure (roughly) the amount of fabric caught in the pleats. I am not instructing you to use this unscientific method because even though it has yielded good results for me, there are better and more precise ways to do it. But if you want to, go ahead. It gives me a good idea of just how much ease is in there to begin with, but it is a bit more time-consuming than others because you cut, sew, and then measure, as opposed to just measuring. Keep in mind that I always make a muslin of the bodice, and so I am not sewing/ ripping out in my good fabric when I do this. Take it out and iron it (even though I didn’t). Even if you don't like this floral tablecloth, trust me, it makes things much easier to see. Pin this pattern to the pattern paper and cut it out normally. After you cut it out, place a pin (or two) at three points on the pattern paper: the center line and the two existing notches on either side of the shoulder cap. Now the important stuff begins: to reduce the ease on the RIGHT side, bring the RIGHT line to meet the center pin/s. Do not bring the LEFT line to meet the center, even if that is intuitive for you (I mention this because it made more sense to me the first time to do it that way). Special note: you do not need to redraw the notches. They are useless as a sewing tool, but useful as an aid for this process. If you read the articles above, you will learn that most notches are there to represent the point at which you should begin gathering (not always where the sleeve meets the shoulder), and you will not need to gather very much (if at all), so don’t think about them overmuch right now. Cut off the exposed part and return the center shoulder line to starting position. You have now reduced the ease on one side! Here is what it will look like from the back when finished. Bring the LEFT line to meet the center pin/s this time. Use the new pattern to cut out your new sleeve on your shell fabric. Sew as instructed, gathering a bit if necessary. You will notice that it is, obviously, possible and easy to do this on your shell fabric as well, but I strongly encourage you to make a muslin first. You don’t want to make a cutting error and not have enough fabric for another sleeve, since many patterns (vintage patterns in particular) have very “tight” layouts. Having to make a sleeveless dress is one thing, but a sleeveless coat is another story. I hope this helps some of you on the road to freedom from shoulder cap ease conventions. I love this method and think it is great for beginning sewers in particular. If any of this is unclear, please e-mail me at madebymonet@gmail.com!